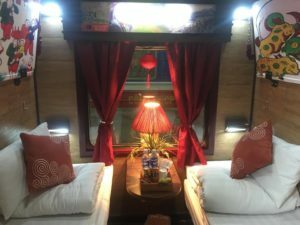 Dream Express Train – One of the best options for the train to Sapa with great services. Dream Express Train is one of the newest trains running Hanoi-Lao Cai- Hanoi route. With adequate equipment, cozy atmosphere and impressive decoration, Dream Express Train is able to offer interesting journey with reasonable price compared with other high-class trains. Featuring two carriages, Dream Express Train offers not only 4-berth cabins which are highly appreciated by families but also VIP 2-berth cabins which are more preferred by couples and travelers who value privacy and spacious place. Not standing the high rank as other top-class train carriages, Dream Express is still adequately furnished with modern facilities and comfort interiors, ensuring to make the trip worthy and memorable. Wooden-paneled cabins with soft –sleepers, reading light and especially intimate décor combined promises to create a cozy atmosphere and to easily induce passengers into sound sleep. Light refreshment with water and snack as well as wet tissue is also provided to customers at no extra fee. There is no restaurant carriage attached along with Dream. Toilet can be found at the end of each carriage. – Having a separate wash basin to wash hands; clean and large toilets having aroma of cinnamon. – Professional and hospitable staffs. Price for deluxe 4 berths is $32 and VIP 2 berths is $65. Price for deluxe 4 berths is $32 and VIP 2 berths are $65. Any changes in schedule due to weather effects or unexpected circumstances will be promptly announced to customers. You can visit our website www.sapatoursfromhanoi.com to check more reviews about Sapa travel or contact us to book the amazing Sapa tours right away!